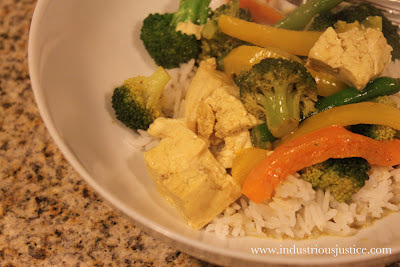 Tofu and Veggie Curry over rice. For the past, oh, I don't know how many weeks, we have been celebrating Meatless Mondays. This has consisted of cooking and eating lots of vegetarian and vegan recipes, especially those that are fast and easy -- perfect for a post work meal. 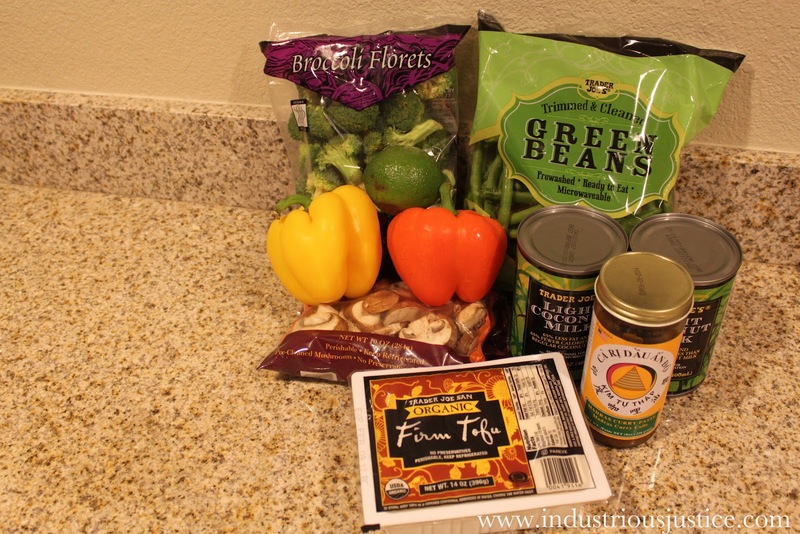 Through our explorations, I cooked up this delicious, customizable vegan curry. Feel free to swap out veggies to make it to your liking. It also makes for great leftovers so you can whip up a batch on Sunday for Meatless Monday lunch. Tofu and Veggie Curry ingredients. 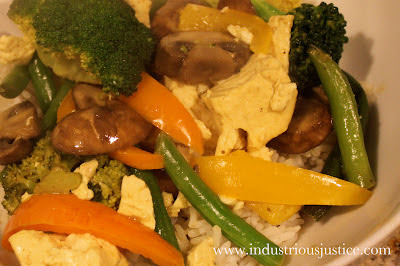 Place tofu on a paper towel lined plate, cover with another paper towel and set a heavy plate on top. When most of the liquid has been squeezed out, slice the tofu into bite-size cubes. Set aside. Heat a large pot over medium heat. Add the curry paste and heat, stirring often, until it is bubbly and the paste has thickened a bit. Add the coconut milk and whisk to combine. Bring to a simmer. Once the sauce is simmering, add the veggies and simmer for 15 to 20 minutes, stirring occasionally, until the veggies have softened. Add tofu, stir gently, and cook until heated through. Remove from heat. Squeeze lime halves over the curry and stir gently to combine. Serve in bowls over rice. I've been on a curry kick lately... and this sounds (and looks, of course) delicious! 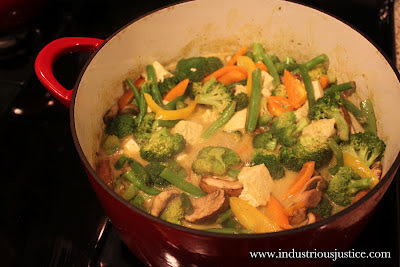 I need to get some green curry paste. Been using the yellow powder too much.